I have a treat for us today with a feature post and a painting by another artist. I hope you enjoy the adventure. Do you ever get that feeling that you are being watched? Then you turn around, slowly, and sure enough you are being stalked? 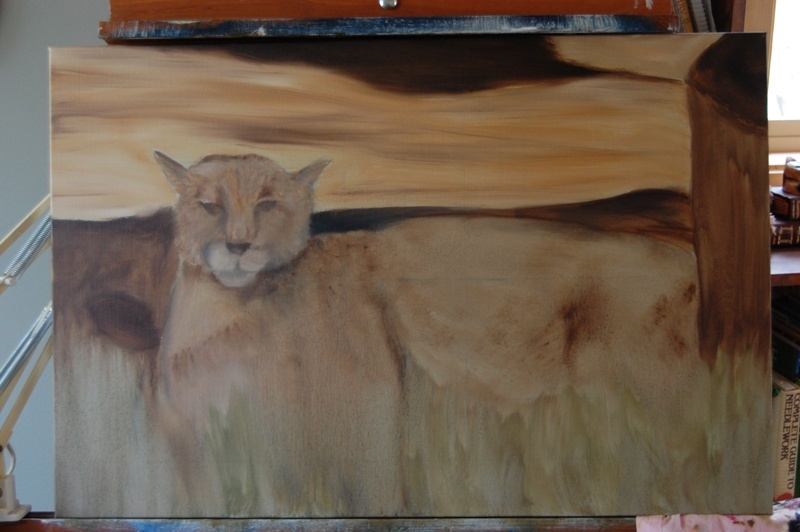 In this case, artist Sue Wiebe’s daughter, Courtney, found that it was a cougar and was able to take a photograph of it that Sue used as a reference for her original oil painting WATCHING. 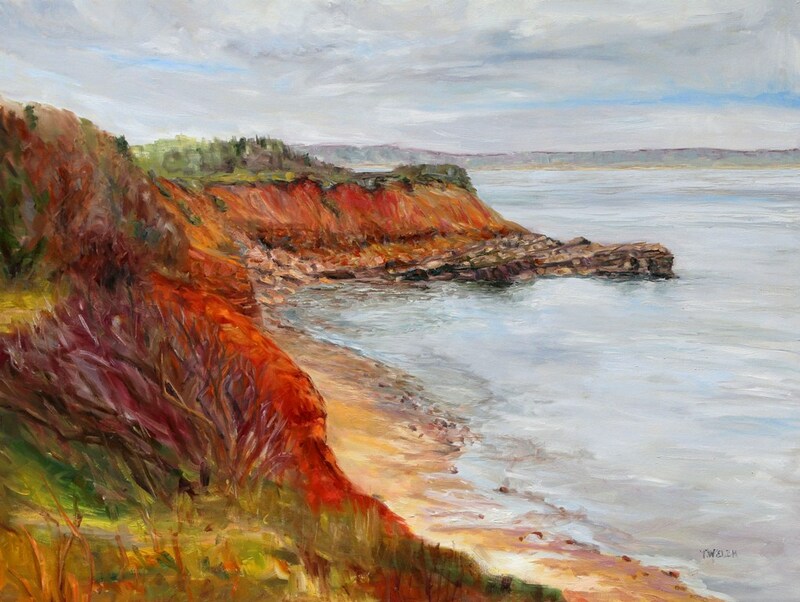 Fortunately for us, Sue took some photographs of her painting in progress. We will start with a look at the underpainting. Next we see the painting building and coming alive. 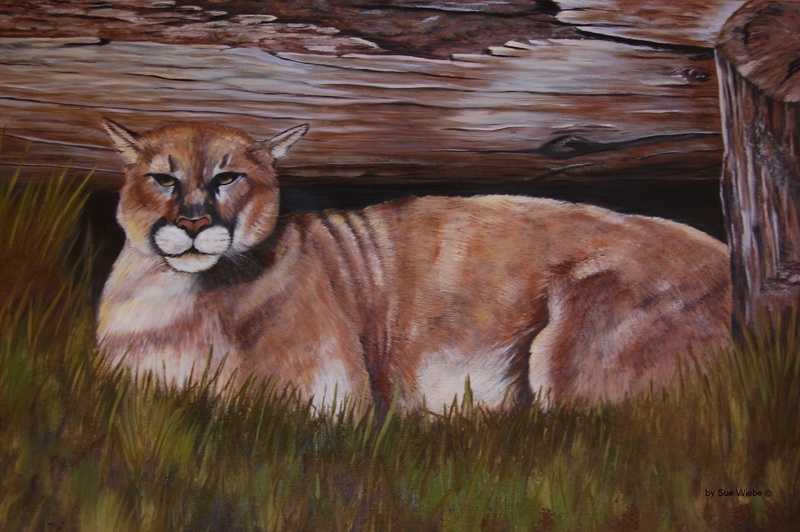 In the finished work it feels like the cougar is ready to spring from her hiding spot under the edge of the log – those ears slightly flattened, attentive, watching. 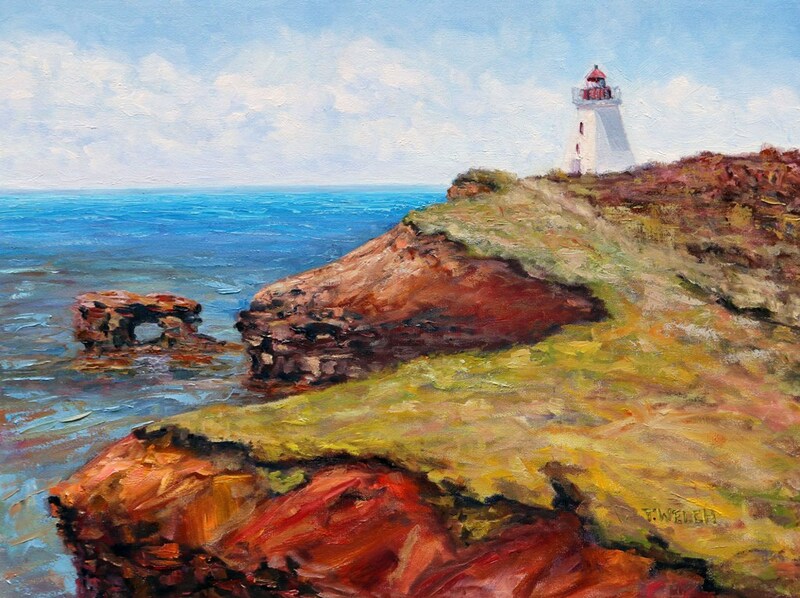 WATCHING 20 X 30 inch original oil painting by Sue Wiebe. It is the biggest oil on canvas I have done so far. It taught me to painting standing up so I had a better range of motion. But the truth of the matter is, I think, the name says it all. The cougar watched me through the whole painting. I would set her aside, sometimes for long periods of time, as other aspects in life needed to be attended to or I puzzled over achieving the effect I wanted, but she was always watching and waiting. Sometimes, even demanding, that I take the time to finish. She is finished, and yet, she watches. If you remember from time to time over the winter Sue would comment on Creative Potager about the hours it was taking to paint fur. Well now you know the rest of the story. Sue has been featured on Creative Potager in the past but for those of you who didn’t know she is my sister. Painting is something that we share with equal passion. 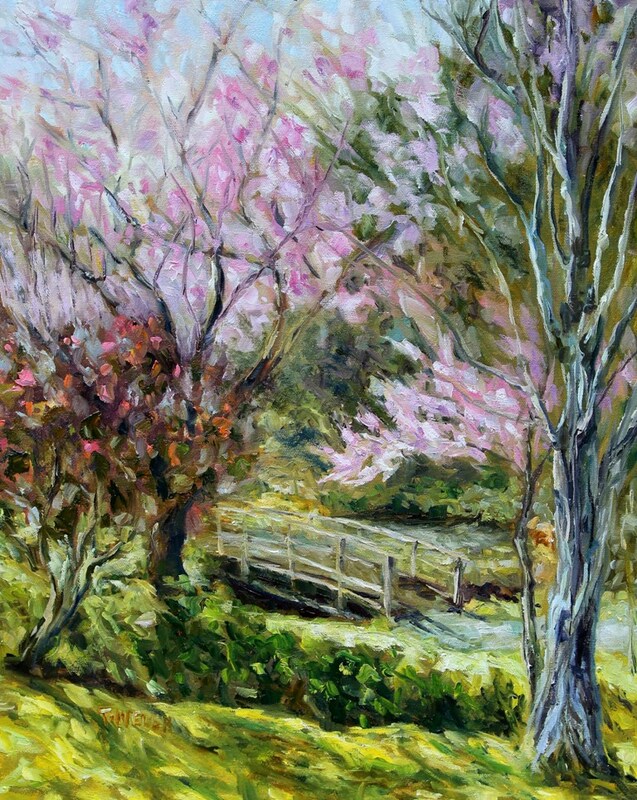 On Friday I have two more of her paintings that I will post for you to see. They are a still life with the most stunning shades of orange AUTUMN BOUNTY and a limited palette painting called COURTNEY IN THE MOONLIGHT. Sprout question: What is a creative passion you share with a sibling or other family member? STUDY OF BLUE solo exhibition opens Thursday June 27, 2011. ← Guess who I met on the road? Terrill – Sue’s daughter Courtney must be a very cool, level-headed soul… to stand still and take a photograph of a cougar looking at you dead-on. Hula Burgers! Once she got over the shock of receiving the photo of the cougar sizing her daughter up… I can well imagine that Sue had a wonderful time being bathed in the gaze of this magnifiscent creature! It’s obvious the “nuts didn’t fall very far from the tree” in that you’re both EXTREMELY TALENTED artists. The two things that my sister and I have in common are loving to be outdoors and traveling. Both of those activities stir my creative juices. Laurie we both were given the same kind of encouragement and environment to develop our talents. 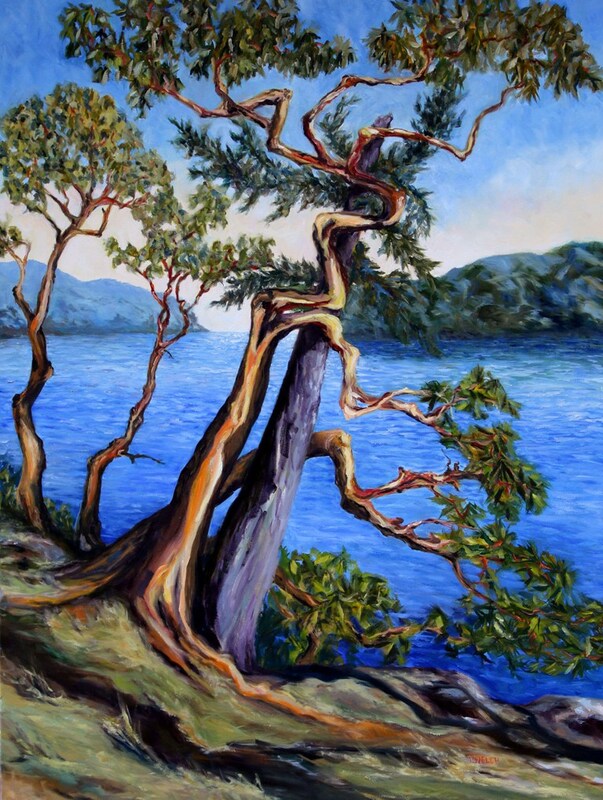 Sue took her formal training in art in a much more traditional manner by taking a year of schooling at the Emily Carr Art College when she first completed high school. It gives me great pleasure to share her work her on Creative Potager. I was telling my mom on the weekend that I was doing post and I could tell (she is a woman of few words – you have to read between them) she was thrilled. 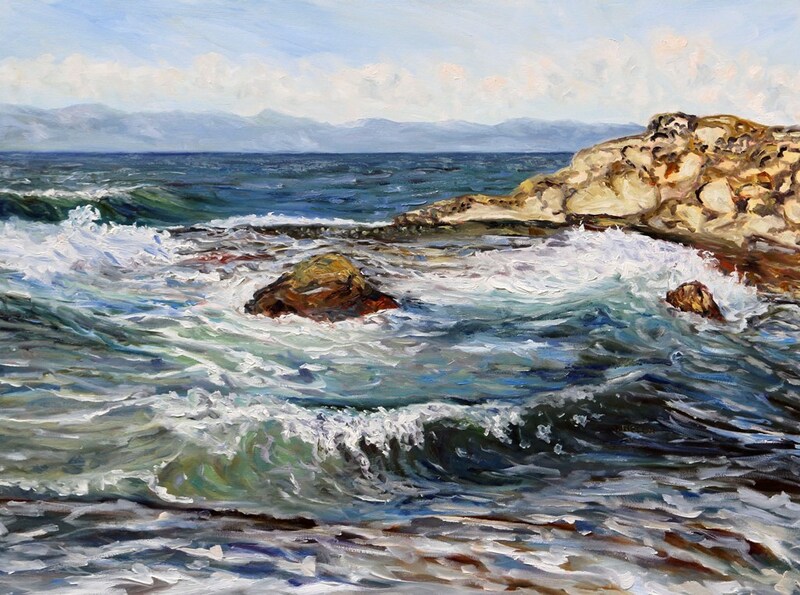 I was talking about how much I enjoyed Sue’s paintings and that I have one that I will share on Friday as the backdrop on my laptop screen right now. I mentioned how different our styles are and yet if we talk about our creative process and our relationships to the paintings they are similar. Mom responded “of course your paintings are different styles, you are very different girls.” At that moment, though it may be true we are “different girls”, there was no doubt that we were both her well-loved daughters. Dear readers, I strongly encourage you to drop by and read “Laurie Buchanan: A tireless crusader for premium health and mental well-being” and take your glass of water with you – there will be plenty of time to drink it as you dip into the cool refined gems that Sam over at Wonders in the Dark has polished to fulfill our intrigue. It is a fantastic interview and one not to miss! Thank you for pointing to the interview that Sam Juliano did with me at Wonders in the Dark. I’m OVER THE MOON for the opportunity and and deeply honored. You are most welcome Laurie and it is my pleasure to and hopefully that of many Creative Potager readers to point us in the direction of Sam’s Interview. As you should be over the moon Laurie this is an excellent interview post. I am still smiling about it. Of course it is all because it is so true to you and who you are that it is what it is. Sam did a great job of capturing your essence. Wow, I didn’t know Courtney took the photograph of a real Cougar! Josie you will have to get her to tell us the whole story when we visit on the May long weekend. I don’t remember the details very well so won’t attempt to share them. Of course Aunt Sue may be drop by and let us know too. 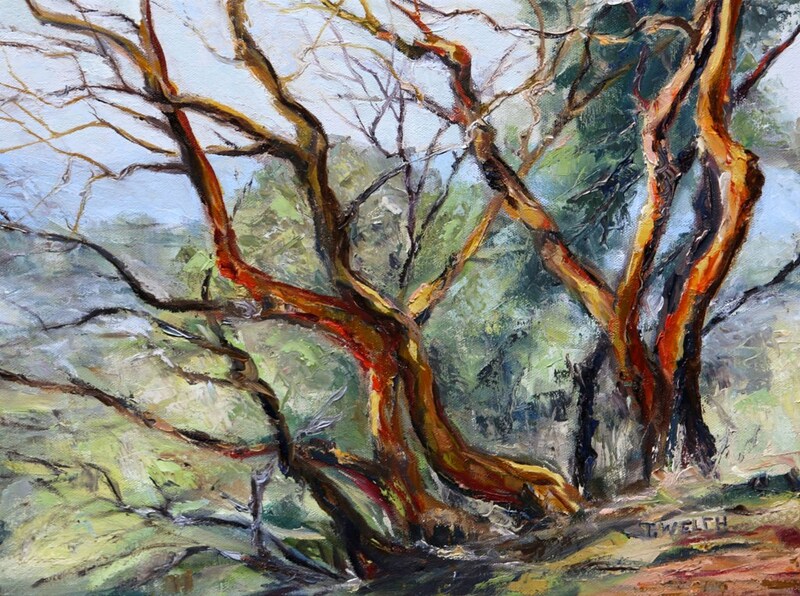 Thanks Terrill for showing my painting. 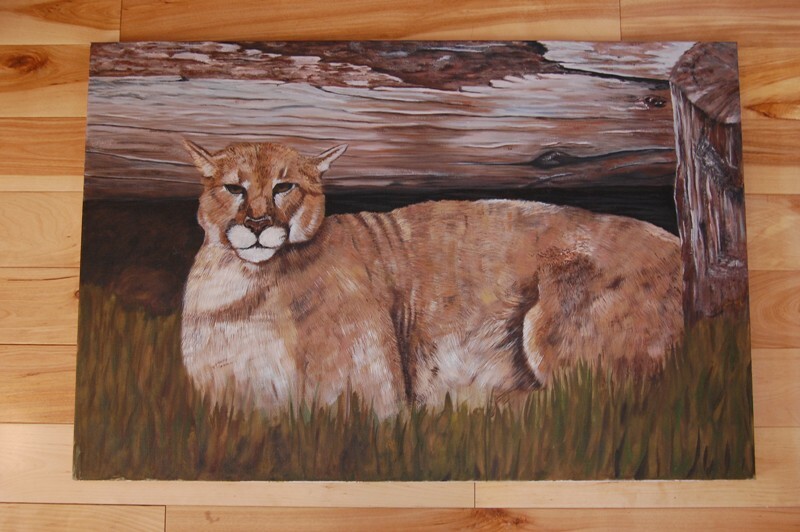 I giggle as I read the comments, knowing I have achieved the feeling I wanted when I painted the cougar because when this particular picture was taken we were at the Kamloops Zoo. Sorry to burst anyone’s imagination bubble! The funny thing is, we were standing right beside the enclosure searching for a glimpse of the cougar, when I got a funny feeling of being watched. I leaned in and then abruptly pulled back. There she was,less than ten feet away, from where we were standing, watching us look for her. Magnificent and eerie at the same time! That is as close as we, hopefully, will ever be to a cougar. They do live in our area, and the previous owners of our property saw their little dog, who was dawdling behind them as they walked down their (now our) driveway, in a flash disappear in the mouth of a cougar. The cougar just scooped it up and kept on going. Thanks again for sharing your space and creativity with me, Sis. It is with great pride and pleasure that I share your work Sue. I am looking forward to sharing two more of your paintings on Friday as well. Thanks for sharing the story of the cougar photo too. I think readers will feel much better know that Courtney was not in immediate danger getting a great nature photograph that resulted in this stunning painting. I honestly didn’t remember how it came about though I remembered the story about the loss of the little dog which was taken by the cougar on your driveway. Dear readers, Sue lives in a rural area outside of Armstrong, B.C. On her walk with family recently they saw a large cinnamon coloured sow bear with two cubs across a small field. Large wildlife such a bear, wolves or moose do not live on Mayne Island. Only rarely is there a cougar sighting. Are island is too small. I must say, I find it easier to walk knowing there is not likely to be a predator around. Mostly, these animals are wary of people and will keep their distance or run away even before they are seen. But sometimes not. A person should always be careful, particularly in the spring when mamas have new babies. Even deer can be aggressive if crowded. Glad you enjoyed the post Daisy and a sister who is a writer as well – very nice. 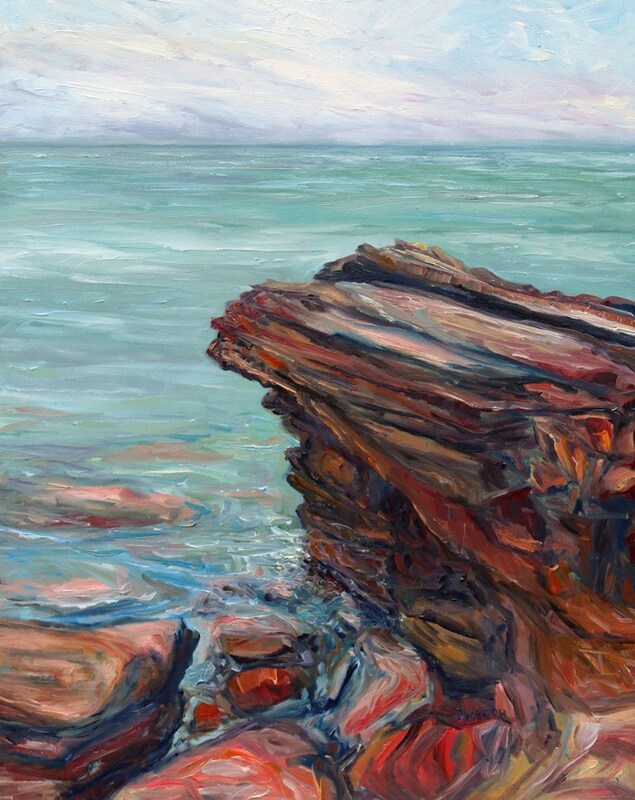 I was over to your excellent post “Standing at Water’s Edge” with guest Anne Paris PHD. today. I sure hope people take the time to drop by and give it a read. I share no creative talents with my siblings – thus other than I look very much like my brother and mother, I thought I was adopted most of my life. !!!! Well we can be quite different from our birth families at times Patricia. Maybe that is why we like to create intentional communities… You may like the link to Daisy’s post I just put in reply to her comment. Worth a look anyway. I inherited my desire (need) to write from my dad who inherited it from his father. One of my most prized possessions is my paternal grandfather’s memoir. I never knew him–he died before I was born–,but now–after reading his words–I feel like I do.